I've mentioned before that we've got a footpath that runs across the top of our fields. This doesn't cause me much concern for most of the time, I've had a few incidents with dog walkers dogs attacking chickens but on the whole it been fine, people shut gates and most are respectful of the country code. Yesterday a walker came up to the house and said they'd found the plywood that slides up and down to make it easier for dogs to go through down the field broken in half. It's not a thin bit of ply (5/8") so it would have taken some force to break. I was quite annoyed by this, for starters if my sheep had been in there then the lambs could have escaped, luckily they weren't. But mainly because some one went out of their way to damage it. For now I've screwed it shut and left a note explaining why it's shut and when I get chance I'll have to make another sliding gate for it. Part of me doesn't want to bother but then there are a few elderly walkers that will struggle lifting their dogs over. If I do repair it and it gets damaged again then the walkers will have to just use the stile and lift their dogs over. Do many stiles around where you live have access for dogs? Most of the stiles near us have access and I'm always really grateful. I'm not elderly but one of my dogs is a Saluki cross, so fairly highly strung (panics when he's picked up! ), not light and with very long legs. Getting him over stiles is rather a performance, especially a couple that are either on a gradient so I'm lifting him uphill or onto a narrow footbridge the other side. It's OK if I'm with my husband but I struggle by myself. He and my other dog (same weight but more compact and more cooperative so it's a bit easier to lift her) will do anything to avoid getting put over a stile and squeeze through tiny gaps under gates and in hedges! Sorry about your stile. I never understand why somebody that's walking in the countryside would go to all that effort to wreck something. It annoyed me more than I thought it would to be honest. Lifting dogs can't be easy! I've never seen a dog access on a stile. 'Kissing gates' (swing gates) seem to be the most common here & although some are a tight squeeze when wearing packs & winter gear, at least they are easy for dogs & more user friendly to all walkers. Kissing gates are around here as well, but stiles are far more common. we have 2 stiles and a kissing gate where there are horses. our dogs jump over the stile on their own as they are small and can get on to the step. I hate it when people vandalise things. I have fond memories of kissing gates as a child! I remember one by the church near where we lived as children and we'd always ahve to kiss as we went through! Vandalism is such pointless destruction I just hope there is Karma as these sort of people need payback. 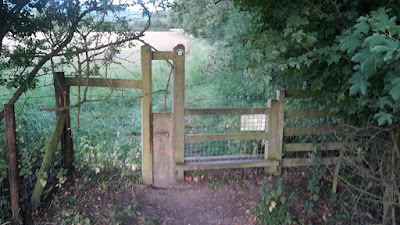 It never occurred to me that land owners maintained stiles and gates on footpaths, I guess I thought there was a magic fairy who did it! It surprises me that vandals would be out walking there must be softer targets with out any effort. i think i can get a grant to replace them I think if they rot, but I'm not sure. If it happens again I had this thought already! There's quiet a few around here, and there;s one the other end of this little walk to the village so it's a shame to make it hard just the one end. I have used the kind of stile you describe and they are very handy and dog friendly. Such a shame that by vandalising yours, it may affect the walking pleasure of others, but I wouldn't blame you for nailing the door in place, you have to think of your livestock. It's always one bad apple that spoils the lot. Looking again at your dog stile, I wondered if it could have been damaged by people (youngsters??) who thought it would be fun to climb on to the highest part by standing on the plywood. Otherwise you can only imagine it tempted someone to try to kick it out of the frame. I think it was taken out and snapped away from the stile. It would take some breaking, certainly not from kicking it, I could see where it was bent to snap it. We don't have stiles over here, I guess because we don't have small farms, smallholdings like you do. The only place you would see people walking dogs would be in city parks and streets, off leash areas or out in our national parks. The national parks only have fences to keep the wildlife off the highways. If you are walking in the park you need to have bear spray, jingle bells and have your dog on a leash and be with a group. We have several bear,cougar or coyote attacks every year. You guys have some big areas of national park to walk around! You also need to eb much more kitted up in the wilderness out there, worst you'll come accross here is a badger, fox or the urban legend of a large black cat! You're only around to walk on footpaths, many have been in use for hundreds of years and would have been how people would have got from village to village. I seriously doubt if there are 1000 stiles in all of America. Then again, we have very few public foot paths through private property. If we did, young males would destroy everything they could get their hands (and feet) on. In this area there are loads of footpaths, I have another running through a field I rent as well. Mostly they cause no problem, in the Uk they are somewhat of a institution. I use them myself on many occasions! 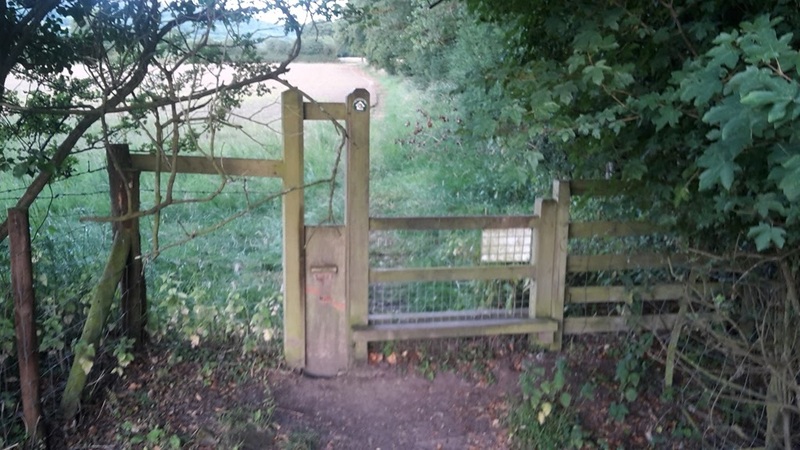 I am in the process of building one of these into a stile on our land, partly for our own convenience, and I note that many designs include something to prevent the sliding part from being removed, presumably to stop this sort of thing or to prevent someone taking it out and leaving it out. There is a British Standard for their design which is actually quite helpful and I found a guide to it that shows a design. Try Googling Guide to BS 5709. There is also a couple of designs on the Scottish Natural Heritage site if you are interested.